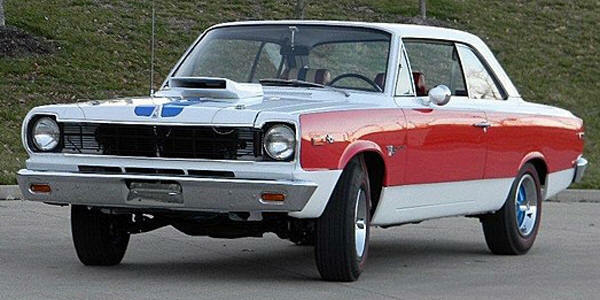 Laugh if you will, but the 1969 AMC Hurst SC/Rambler could blow the doors off some pedigreed muscle cars. Too bad AMC had to compensate for its slim advertising budget by making a billboard of the car. Yes the car was plain ugly, but it was plenty fast for a Rambler. It had the build quality of a typical Rambler American which was real bad but certainly wasn't great. Most people bought these cars for around $2700 to race. Very few if any saw them as a serious collector car simply because they were so ugly and of course a Rambler. Would I personally invest $60,000 into a restored example like this one ... of course not ... I'm not that stupid. But obviously someone did. Having dipped into performance with the '68 AMX and Javelin pony cars, Detroit's No. 4 automaker decided to expand into the budget-muscle arena with -- don't snicker -- a Rambler Rogue compact. Directed by Hurst Performance Research Inc., the project followed the simplest hot-rod canon: stuff in the biggest available V-8. In AMC's case, that was the AMX's 315-hp 390-cid four-barrel. A Borg-Warner four-speed with a Hurst shifter and a 3.54:1 limited-slip completed the drivetrain.Heavy-duty shocks, anti-sway bar, and anti-hop rear links fortified the suspension. E70Xl4 Polyglas tires and the AMC's optional heavy-duty brakes with front discs were included. Inside were reclining buckets. Instrumentation was standard Rogue with the exception of a Sun 8000-rpm tach strapped to the steering column. The car debuted midway through the model year as the AMC SC/Rambler-Hurst; most called it the Scrambler. Only 1,512 were built, and they were potent little screamers. But that exterior treatment! No one seemed to like it. A "tri-colored nickelodeon," said Car and Driver.All SC/Ramblers started as appliance-white hardtops with two-tone mags, racing mirrors, blackout grille and tail panel, Hurst badging, and a real ram-air hood scoop with an upthrust snout that unfortunately recalled the nose of a hound sniffing for the scent. About 1,200 Scramblers went full "Yankee Doodle," with broad red bodysides, wild hood graphics, and a fat blue dorsal stripe. The rest made do with only simple rocker-panel striping.